Kentucky Governor Steve Beshear signs House Bill 178 adding a tax form donation check off box for Special Olympics Kentucky and the Pediatric Cancer Research Trust Fund. Saying “Let me tell you, if you’re into sports and helping people, Special Olympics is the organization for you,” Governor Steve Beshear held a signing ceremony for House Bill 178 today, surrounded by Special Olympics athletes and supporters and members of the General Assembly. The bill provides a check off box on the state tax return form, which will allow taxpayers to donate a portion of their refund to Special Olympics Kentucky. Among those attending the signing ceremony was Representative Martha Jane King (D-Lewisburg), who filed the bill and championed the effort throughout the legislative process in order to get the bill passed. 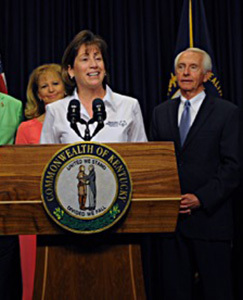 SOKY President and CEO Trish Mazzoni speaks at the signing ceremony as Rep. Martha Jane King and Gov. Steve Beshear look on. 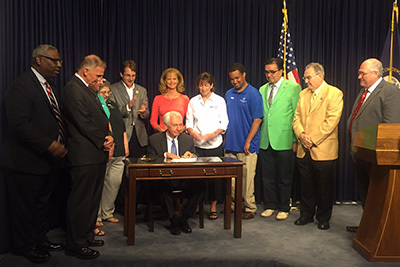 Special Olympics Kentucky President and CEO thanked those who helped the bill become law. In addition to the check off for Special Olympics Kentucky, House Bill 178 add a check off box to the tax form for the Pediatric Cancer Research Trust Fun that Beshear said would be administered by the Cabinet for Health and Family Services. For more information about House Bill 178 or about how you can support Special Olympics Kentucky through the tax form check off box next year contact Trish Mazzoni, President and CEO of Special Olympics Kentucky at 502-695-8222 or tmazzoni@soky.org.